Today’s portion of Chapter II reminds the abbot that he will undergo the dreadful judgment of God on two matters. The abbot will be judged first on his teaching. You know, dear sons, that I believe absolutely in the value and importance of the daily chapter. The abbot’s daily chapter shapes the community’s observance and rejuvenates it constantly. For this reason, I will not dispense myself from the obligation of the daily chapter except for reasons of serious illness or unavoidable absence from the monastery. I am equally unwilling to dispense any brother from the daily chapter save for reasons of illness or matters of the most urgent necessity. 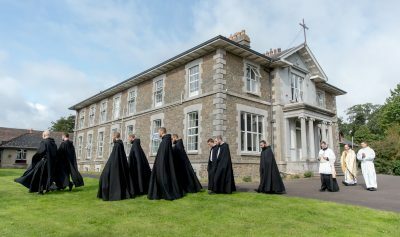 A community rises and falls on the abbot’s commitment to provide his sons with a daily chapter that is enlightening, invigorating, and challenging. The abbot who is permanently impaired from giving the daily chapter is, I think, bound to give his place to another who can do it. I must examine my own conscience frequently on my teaching. Do I dilute my message because I seek approval and fear falling out of favour? Is my teaching deficient because I fail to prepare it in study and in prayer? Is my teaching remote and notional because I myself prefer ideas to the hard work of conversion of heart? Do I try every day to offer my sons something that will comfort the weak, challenge the strong, stabilize the wavering, correct the wayward, and promote an observance marked by good zeal and joy? Harder to understand is Saint Benedict’s assertion that the abbot will also be held accountable for the obedience of his disciples. All sorts of ideas about personal freedom come to mind in an attempt to explain away what Saint Benedict sets forth. The abbot will, at the end of the day, be judged on the obedience of his disciples. This implies that the abbot will be judged also on their disobedience. Let us assume that all the brethren are obedient, and that their obedience is cheerful and prompt: such obedience comes about in a monastery because the abbot has “studied rather to be loved than feared” (Chapter LXIV). It is hard to obey an abbot who inspires more fear than affection, who is volatile, harsh, unjust, and distant. It is easy to obey an abbot who is warm and encouraging, who is even–tempered, meek, just, and present to the community. You begin to understand, I think, why Saint Benedict makes the abbot accountable for the obedience of his disciples. The abbot must be the sort of man whom men are happy to obey, a man deserving of their trust, a pioneer who knows how to inspire generosity and valour. I have known such abbots: some personally, and others from having encountered them in the annals of monastic history. The abbot has assumed a sacred duty to employ all pastoral diligence in caring for those of his flock who are unquiet and disobedient. He must do whatever he can and, relying on divine grace, even attempt what he thinks he cannot do, in order to save the brother who finds himself in a downward spiral. If the abbot is a man of experience, he will know that it sometimes happens that a brother is disobedient not because he wants to disobey, but because there is something in him that makes it very hard or nearly impossible to obey. The abbot must work with such a brother patiently and tirelessly until the hidden obstacle is identified, uncovered, and removed. This may take a long time. The abbot must repeat to the brother: “Even if you are tempted to despair in this struggle, I will never despair of the mercy of God for you, nor will I cease to believe that you can do all things in Christ who strengthens you”. With regard to the obedience of his sons, the abbot will ask the Blessed Virgin to make him the sort of abbot whom men find it easy to obey. This does not mean that such an abbot will never have to command hard things, or even enjoin things that a brother judges impossible. It does mean that he will command with courtesy, strength, and firmness, taking care always to fit his commands to the weaknesses and strengths of each one. When the abbot sees that a brother finds it hard to obey, he will first search his own heart to see if there is not in him something that is a stumbling block for the brother. The abbot will place himself unreservedly in the hands of the Blessed Virgin Mary, asking her to change in him whatever he has failed to correct, or purify, or amend in himself. And then he will present to the Blessed Virgin Mary the brother who finds it hard to obey, asking her to bend his will to obedience, and to reward even his smallest effort with a sign of her maternal solicitude and an increase of grace. govern the ruler that you have approved. rule me so that I may rule others. rule them, and me among them. for I am not mine but yours. and by your death you have redeemed us. you do not therefore desert me or them. I commend myself and them to you. Yours is the flock, Lord, and yours is the shepherd. Be shepherd of both your flock and shepherd.